A RUP LIFE: Quilts of Love | MASTERPIECE MARRIAGE #review & Kindle Giveaway! Quilts of Love | MASTERPIECE MARRIAGE #review & Kindle Giveaway! A Rup life received a promotional copy to facilitate this review. This post may contain affiliate links. I'm pleased to bring you my latest review in the QOL book series! Masterpiece Marriage by Gina Welborn is set in 1891. This brings an interesting story because things were very different in the 1800s compared to the 2000s! Women's roles have changed dramatically as have fashion. This is the tale of Mary Varrs and her pursuit of eduction in a time where women were not considered 'educatable'. In Varrs' world she must choose between the education she wants (and the consequences that go with it) or a traditional family life. Enter a meddlesome Aunt/neighbor, a quilting project and one handsome nephew - and the story heats up quick! I loved this tale! The characters were likable and I liked how the females were so true to their times. Often authors take liberties to make the women be defiant towards societal rules and God because of their station in life. Welborn kept Mary a true lady at all times and I thoroughly appreciated that. 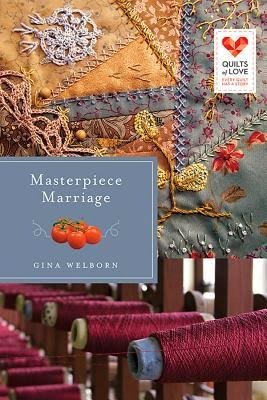 Don’t miss the newest Quilts of Love book, Masterpiece Marriage by Gina Welborn. December’s QOL release celebrates the ebb and flow of marriage. Enter to win a Kindle HDX! Enter today by clicking the button below. But hurry, the giveaway ends on January 18th. Winner will be announced on the Quilts of Love blog January 19th. Enter today and spread the word—tell your friends about the giveaway via FACEBOOK or TWITTER and increase your chances of winning.